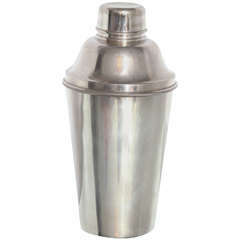 Elegant French modernist silver plate cylindrical cocktail or Martini shaker by silversmith Gelb, Paris. Three sectioned designed cocktail shaker with removable cap and strainer. Lovely Minimalist shape with simple neat design. Marked underside with legal silversmith hallmarks. Measurements: 2.75 in. diameter (7 cm) x 8.50 in. high (21.5 cm).